Happy Friday!!! We have been having WAY too much fun this week, which will be evidenced by an exorbitant number of photos in this post. Brace yourself. First up, one of my very FAVORITE Etsy shops, The Fierce Chipmunk, sent Griffin a few hair pretties and I snapped a bunch of pictures of her in the hopes of getting something good. This little tieback is PRECIOUS and the detail and colors are amazing! I absolutely ADORE this picture in black and white and have added it to a file on my desktop of pictures to have printed for the frames in her room for when I decide to change them out. Can you even believe this flower crown??? How on EARTH is this handmade?!?!?! Next up is this picture that Sheaffer posted on Monday. One of my FAVORITE girls!!! The pool officially opened on Monday and my kids were chomping at the bit to get in the water. Luke thinks he OWNS the water, despite not being the strongest swimmer right now, so I called up my FAVORITE extra set of hands (and eyes!) to join us. I try my hardest not to be a worrier, but the pool with three kids freaks me out.... too many little people to watch and not enough eyes to do so. The dimple says it all. I mean. How blessed am I to have AMAZING teenagers who love my kids?!?! Just in case he hadn't claimed his FAVORITE person status already, Zak proceeded to craft a noodle flotation suit. 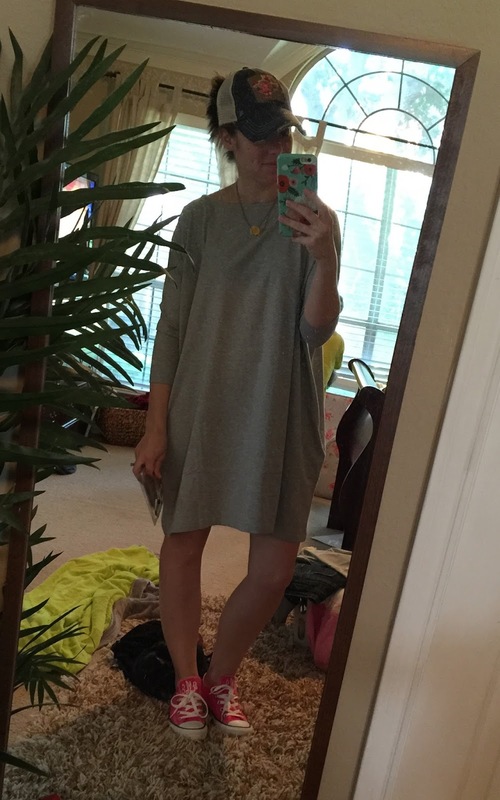 I mentioned my new FAVORITE super easy t-shirt dress last week and I wore it yesterday (in solid instead of the stripes) with my monogrammed chucks and Texas hat. We were running errands and I was cool and comfy. ... or the naps after ;) Just kidding. It's the naps. While the boys checked out their FAVORITE toys at WalMart, Griffin bossed around the minions. One of my FAVORITE meals from the week? Chicken tortilla soup. Amen. And one of my FAVORITE moments? Watching G catch bubbles while wearing a bubble. LOVE. And watching these crazies do their FAVORITE thing, play chase. By the end I don't think they know who is chasing who. On Tuesday we checked out The Coop in Frisco, which is now one of our very FAVORITE places! If you're not local and/or not familiar with the concept, it's this awesome open concept play space with a giant ball pit, light-up dance floor, bounce house and play area. The lobby area is super cute and modern with a snack area and coloring table. This girl has ZERO fear. NONE! Before we left we took some time to color. All three of my kids had a blast and we will most definitely be back. I had packed them a lunch so we ate that in the car (classy!) and then made one last pit stop at Dimples cupcakes. They were wiped out by the time our morning/afternoon was over and I had to crank down the AC and blast some Uptown Funk to keep everyone awake on the ride home. So much happy in this post I love it! That noodle float is a masterpiece. AnnaGrace better watch out is right. Lol. Happy weekend sweet girlie! I love all the photos on your blog! What a fun week you and your kids have had! My kiddos need to go check out the Coop too! See you later this morning girl :). We need to go one day this summer! Excited about seeing you and your people today at the pool!!! Hi! 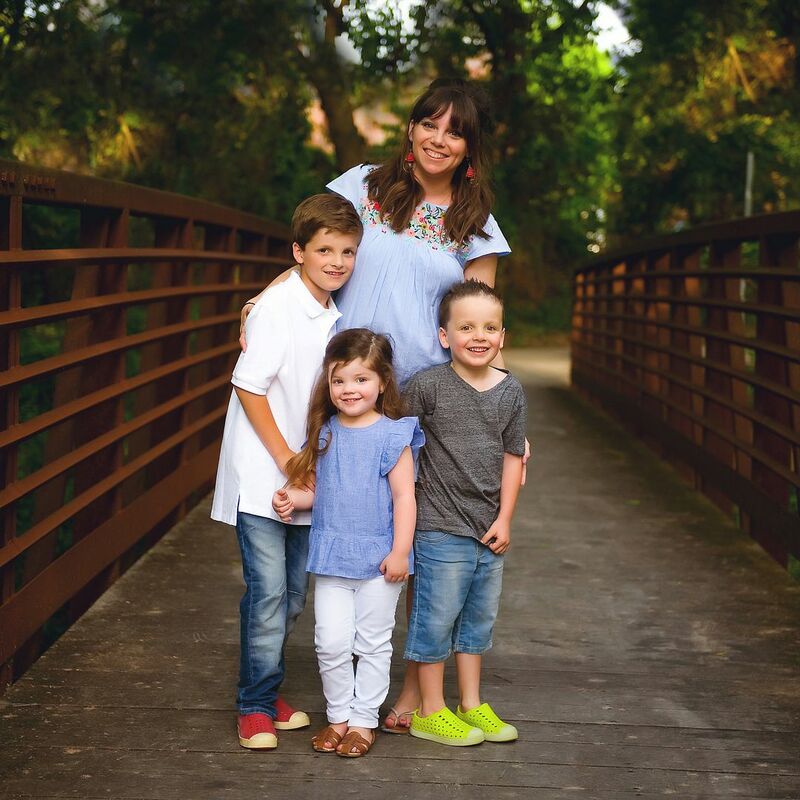 My first link up with you and I so LOVE your post full of happy smiling faces! With every picture of the ball pit in orange, yellow and white I kept thinking ohhhh how cute would that be for Halloween pictures (they reminded me of round candy corn - HA!) I can't wait to go back and read some of your previous posts now! Happy Friday from SC! They totally look like candy corn! We may have to hit them up again around Halloween :) Thank you so much for your sweet words and for linking up! Aw, you have had a great week!! Yay for summer, and GG playing in the bubbles is so precious!! Love!! The Coop looks like an awesome place! My second thought after thinking about how fun it looked was...I wonder how clean it is. Those ball pits...so that is great that it's so clean. I love the snacking area too. It looks like a place I would love to hang out! It really was great - and I was skeptical about their claims of cleanliness, but so impressed! Yeah the shirt came! One day she will be able to wear it lol. Super cute pictures of everyone. Please post your recipe for the Chicken Tortilla soup. It looks AMAZING!!! Seriously! What a fun way to kick off summer! Mason in the Hey Girl shirt is the most adorable thing EVER. Seriously..I am dying. The Coop looks like way too much fun! We need something like that around here! Isn't it wonderful to have teenagers want to hang out with your kiddos. It makes life so much easier. We took our favorite on vacation with us last year so Jake and I could get a few date nights in and it was the best thing ever. Yes! I love that my kids have awesome teenagers to look up to! And the extra sets of hands and eyes are priceless! I think I saw The Coop on Shark Tank last year. It looks awesome! Also LOLOL at Mason's shirt! That is so hilarious! such a fun week! It's great to see that Anna Grace still spends time with your kids, I had to search for her in your blog. She seems like such a wonderful young lady. The Coop looks really awesome! And, YAY for summer!!!! We are in the home stretch....5 more days!!! I need to borrow someone's children so I can go play in a ball pit...I LOVED those when I was little! That Ryan Gosling shirt is perfect. Andrea!!! You are my new favorite person...how in the world did I not know about this place (Coop)??? I cannot wait to check it out. I hope it's not crazy busy in the summer. All the ball pit pictures!!! Griffin is seriously the cutest thing ever! I love the way you dress her. Adorable!